Implementation of the WLAN security standard (802.11i) requires the NIST standard AES cipher in CTR and CBC modes (a.k.a. CCM) for encryption and message authentication with the CCMP protocol and RC4/”Michael” cipher for the TKIP. The WPA3 core is tuned for high data rate 802.11i applications (up to 2 Gbps for the CCMP protocol for 802.11n/802.11ac). The core contains the base AES core AES1, base RC4 core ARC4 and is available for immediate licensing. CPU Input Microprocessor bus for programming. Multiple interface versions available. MEM Input Local memory bus. Multiple memory configurations are available. The Advanced Encryption Standard (AES) algorithm is a NIST data encryption standard as defined in the FIPS-197 ( http://csrc.nist.gov/publications/fips/fips197/fips-197.pdf ). CCM mode is defined in NIST SP800-38C (http://csrc.nist.gov/publications/nistpubs/800-38C/SP800-38C.pdf ). 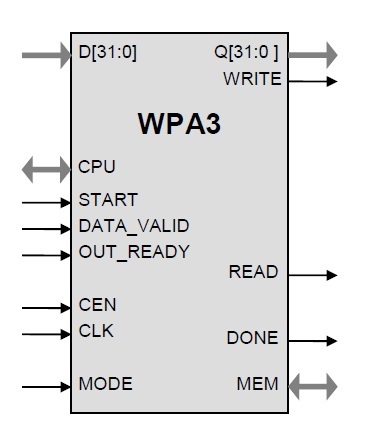 The WPA3 implementation fully supports the AES algorithm for 128 bit keys in Counter Mode (CTR) method of encryption with CBC message integrity check as required by the CCMP protocol of the 802.11i standard. The core also supports ARC4 cipher with “Michael” authentication for the TKIP protocol as defined by the 802.11i standard. The core is designed for flow-through operation (FIFO-like), with byte-wide input and output interfaces. The key and nonce information are stored in the local memory and automatically updated. PHY header precedes the packet in the data flow. Core performs all necessary per-packet calculations, parses and modifies the packet headers. The decryption results are indicated in the dataflow, including the replay protection. WPA3 supports both encryption and decryption modes.